Perfect to provide you a light weight and slim solution. It keeps the true feeling of iPhone 6/6s and preserves its original beauty cases. Combination of soft, hard and flexible materials, this case can provide perfect protections for your new iphones. DURABLE - Reliable yet flexible transparent material provides protection, as well as a stylish look for the new generation Apple iPhone 6S /6. Go on and show off your new phone to the world without having its protection compromised! This soft gel case comes in different versions to fit all iPhone models. There are many different dog breeds to choose from too. 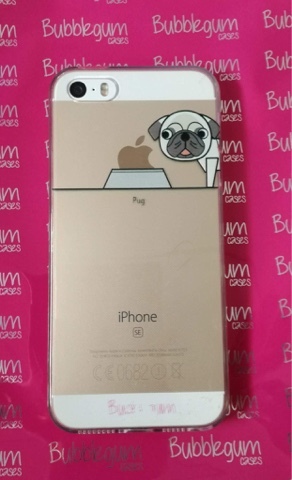 I choose the pug version for my iPhone SE. The case is clear with a cartoon dog and a dog bowl printed on it. When the case is on your phone, it looks like the dog is eating the apple logo from the bowl. So cute! The case fits my phone well and it feels like it protects it. The only negative point about this case is that the bubblegum logo is starting to rub off after just a week. It's a shame as it makes the case look a bit scruffy. I love this case and so do my friends at school. 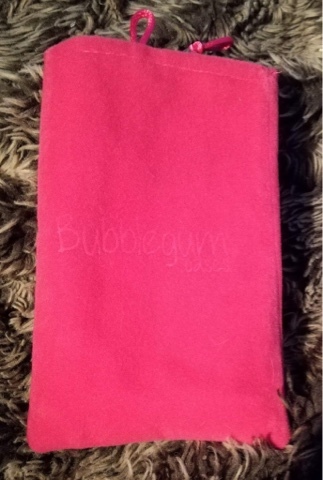 It comes with a bright pink gift bag to keep the case in when it's not in use, which is a great added extra. At £4.99 I think this is good value. I would have given this case five stars, but I've dropped one star because of the logo rubbing off.